The Microcom Desktop DigiTrakIV receiver system enables users to receive DCP data signals directly from GOES satellites. Optional configurations will demodulate METEOSAT and GMS satellites. The system design is based on modern DSP (Digital Signal Processing) technology. This is the same technology that Microcom employed in NOAA’s GOES national receive site at the Wallop’s Island NOAA Command & Data Acquisition Station. 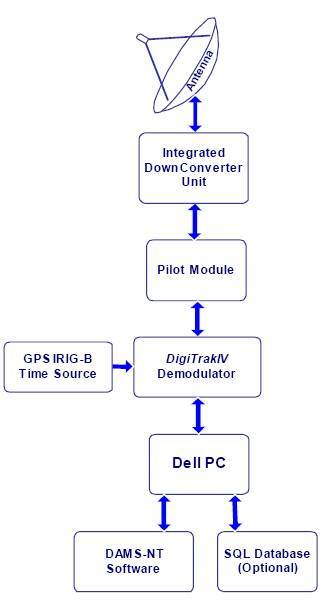 Each DigiTrakIV demodulator supports any channel for any data rate; 100, 300, or 1200 BPS modulation formats. Auto 100/300 baud detection is available.The Desktop DigiTrakIV provides users with flexible system configuration options. 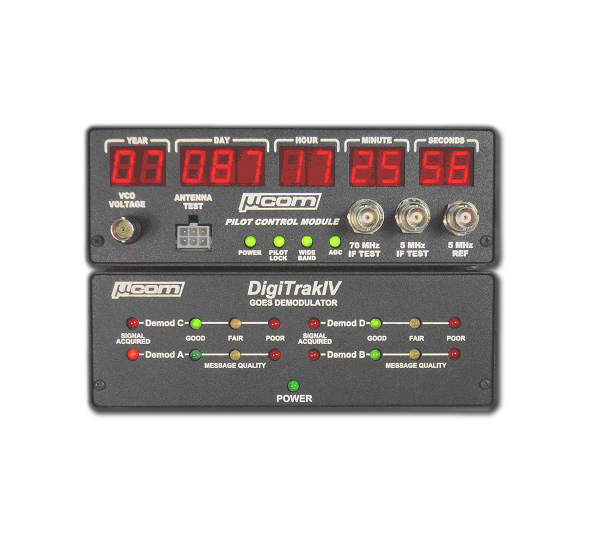 · Each DigiTrakIV enclosure may contain from one to four DigiTrak demodulators.· Microcom’s DAMS-NT Software will support up to four Desktop DigiTrakIV units (16 total channels)· DSP technology enables software configuration and updates.If a user’s network grows beyond 16 channels, the existing investment in demodulators may be employed in the expandable DAMS-NT Receiver configuration. The DAMS-NT Receiver can be configured for 1 to 160 channels (see separate data sheet). The Desktop DigiTrakIV demodulators provide accurate signal quality measurements:· Real-Time operation with no post-processing latency. · Messages can be received with only 0.25 second separation. · Message time stamping to the millisecond. · Carrier, symbol sync, frame synch and measurement end times are all reported. · Amplitude measurements to 0.01 dB. · Frequency measurements (start & end) to ±0.1Hz. Data input and system configuration are accomplished with the DAMS-NT Software suite that is provided with the DigiTrakIV system. All GOES DCP data ingest and system management tools are incorporated in the DAMS-NT Software. The user friendly DAMS-NT Software utilizes graphical system setup and provides real-time status displays.The GOES Pilot Module acquires the pilot signal locks onto it and utilizes the pilot signal to control the frequency and amplitude output to the demodulators. This is done by converting the downlinked 78.75MHz to 5MHz required by the DigiTrakIV. The Pilot Module is equipped with additional output ports for GVAR and LRIT imagery at the 70MHZ IF. Visual Pilot Module operation is provided by LED’s to indicate acquisition and lock status.